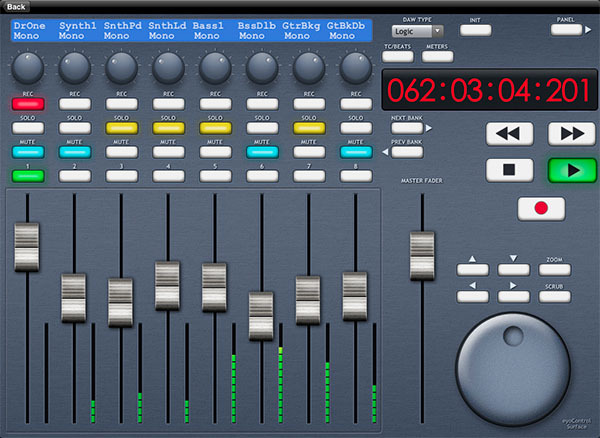 eyoControl by Eyosido Software is a Mobile Audio App. eyoControl 1.2 for iPad includes a new MIDI controller, Transport, result of a collaboration between Eyosido Software and audio software professional developer Vincent Burel (vb-audio). large timecode display, supporting multiple timecode formats and state indicators. a BIG, accurate scrub wheel, with associated scrub button. landscape and portrait orientations (lockable). compatible with the Mackie Control Protocol. mark beginning and end of loops. set/clear markers and navigate over them (prev/next). eyoControl also includes other MIDI controllers such as a control surface, a drum pad, a double keyboard, a multi- X/Y controller. Transport, new controller: transport bar with big scrub wheel and large timecode display, to remotely control basic playing/recording abilities of your DAW/recording software.
. improved timecode display (all digits, better accuracy).
. better scrub wheel behavior (similar to Transport).
. slight graphic update, few items moved around. iPad does not go idle anymore while controllers are running. Controller's orientation can be locked in any orientation mode from Preferences. eyoControl Server mode: the default eyoControl instance name is no more a random name but the iPad's name. smaller controller icons on the Library page. help button on top of the Library page. fixes for app staying long periods in background.